Saypha Rich is a dermal filler that can reverse the loss of hyaluronic acid due to aging. Saypha Rich is comprised of hyaluronic acid and glycerol, both of which act as hydrating agents that increase the tone, elasticity, and hydration of skin. Skin can be visibly softer and more radiant after treatment with this filler. Saypha Rich can be used on all skin types but is especially beneficial in the treatment of skin that is dehydrated or dull-looking and starting to show signs of aging such as fine lines and wrinkles. In terms of treatment regimen, the recommend approach is for patients to undergo three treatments with this filler in a three-week interval. 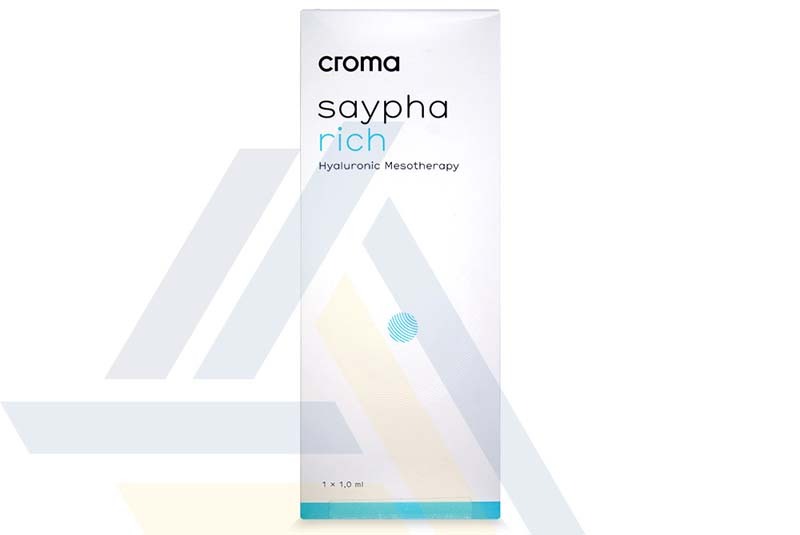 Saypha Rich is made of cross-linked hyaluronic acid at a concentration of 18ml/mg. This filler is also comprised of glycerol. Saypha Rich improves hydration, skin tone, and elasticity, and it can remove fine lines and wrinkles. The effects of this filler can last up to 3 months. This filler can cause a number of side effects. These side effects usually subside on their own within a week and can include tenderness, swelling, bruising, and redness at the site of injection. The skin that is to be treated with this filler should be healthy, clean, and non-inflamed prior to injection. The injection should only be performed by a trained and licensed professional. Inject the filler using the proper injection technique. Following the injection, the skin should be lightly massaged in order to distribute the product evenly throughout the treatment area. Saypha Rich should not be used in patients with certain conditions. For a full list of these conditions, refer to Saypha Rich’s package insert.